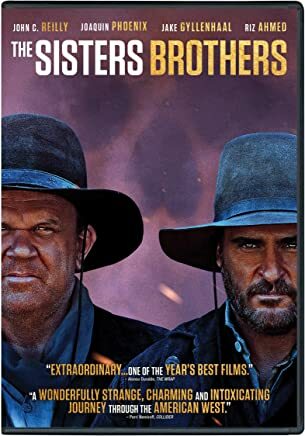 Based on the Man Booker shortlisted novel of the same name, this is a western with a difference, in fact more of a tragicomedy set in the US frontier lands during the 1850s Gold Rush. The central characters are a pair of inaptly named brothers, Eli and Charlie Sisters, widely feared in their role of successful hired assassins for the sinister Oregon-based “Commodore”. Events take a different turn from usual when the pair are sent not just to dispose of a chemist called Hermann Warm, but somehow to extract from him a formula for obtaining gold. Charlie is the duo’s “lead man”, claiming to be the brains of the outfit and perhaps quicker on the draw, but he seems half crazy at times, addicted to the liquor which perhaps serves to blot out past acts of violence, one in particular. Eli is a milder and more reflective character, motivated mainly by the need to protect his brother, although repeatedly courting mortal risk seems an odd way of doing it. Like the book, the film creates a sense of unease when one begins to connect with a pair of ruthless killers because of their amusing escapades in the midst of the carnage, affection and support for each other beneath all the bickering, and the fact that their opponents are often if anything more rotten than they are. We learn that the brothers suffered as children at the hands of a viciously brutal father, but is that a sufficient excuse? The brothers are roughnecks, astonished by the sight of a flushing toilet, while Charlie mocks Eli for his decision to start using tooth powder, but they are surprisingly articulate at times, and literate in their ability to read the flowery letters and journal of Morris, the detective employed by the Commodore to tail Warm. Clearly better educated and on the face of it more decent and honourable men, Morris and Warm provide an interesting contrast to the brothers, yet they too can be forced by circumstance into violent acts. Perhaps the film could have made more of the psychological interplay between these four men. Well directed with good actors and some beautiful mountain scenery, the well-paced plot is let down by an implausible climax. So far, it has been more popular with critics than the public, perhaps because it “falls between two stools”, being neither simply a high octane action thriller, nor a thought-provoking “art film”.